Georgia Classic Rock Cafe Where we play the best in classic rock and so much more...and now in a new location! You will find much more than just a venue here, there is the actual club, and keep in mind I am from Georgia which will explain so much about the venue. There is an open deck to dance or sit right where you land, so if you are lagging you can just settle there and still see the singers and while you listen to the music, a view of water and the beautiful sunset makes you feel like the world has slipped away and you can relax, and focus on making new friends or being with the one you love. It started as a dream. I wanted a club; something I couldn't have in real life. Just a place where I could play my music. Being born and raised in Georgia...surely SL would bask in my Southern Rock, and if it didn't...just keep it classic...what other kind of music is there. It started out in a very small building, with a different name. It was actually a coffee shop on the first floor and a dance area on the second. Turn on the radio....Rock FM. Now it is a much bigger venue on a much bigger parcel of land with a much bigger variety of music. But before and after shows...it's still Rock FM. You can't teach this old dogs new tricks....lol. However Amber brings in many singers from different genres, so if you are in the mood for some country, mellow sweet tones or just a nice mix of music, keep an eye out for who is singing and come enjoy yourself. Georgia Classic Rock Cafe is now located on Main Street...the sim is owned and operated by Ohana Land Estates and we are so excited to have recently moved there. The venue was actually custom made by Kathleen and Coco Spitfire who are members of the Paul Nowles Band. Now let me introduce myself. My name is Rick Scott (rickscott1955), and along with my wife Amber Scott (amber.lefavre). We are the owners of Georgia Classic Rock Cafe. I am the Georgia part of this rocking duo....born and raised there..and I guess I'm also the Classic Rock part. So what does that make my lovely wife Amber. That's easy...she's the boss and a Florida girl. Amber does all the booking for the club. Without her it would just be me and not a multitude of live singers (we book 30 to 50 acts a month) and I DJ at the club on occasion and I will give you the best in classic rock and so much more. 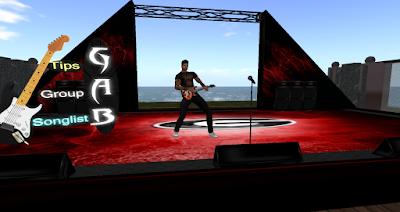 Since our opening in the Fall of 2016, Amber has booked some of the best talent on sl....some of our regulars include Gabriel da Silva, Rayna Gorham, Erik Kottzen, Savannah Rain, NeoMaximus Brandenburg, Toxic Darkmatter, Paul Nowles, Jack Slade, DirtyDee Sweetwater, David Hauptman and Rocker....with so many others like Max Kleene and Quartz and many more to come. We are constantly looking to bring you the best talent that we can find. We have a working relationship with Whispering Sands Live Promotions, The Keys Management Group, Vargas and Associates and many that just represent themselves. If your looking for a club, this is the place to listen to some great music and make some awesome friends. You can join the Georgia Classic Rock Cafe group, or if you do not have space to join, visit the club and hit the subscriber so you will get a notice of who is playing and when , You do not want to miss these amazing performers. Dress is what you want it to be, in the South we call that casual. We hope you will come by and bring your friends, become part of our Georgia CRC family. We want this to be a place where you were entertained, but more important, we want you to just have fun. So come enjoy our southern hospitality, and if that's not enough, how about the best in classic rock.... and so much more.